Round, Ornate, Dining Room Table is a STAR! Blog for those who love D.I.Y., Home Improvement, Home Décor, Junking and Interior Design. Today I was honored to be spotlighted by www.furnitureflippin.com! I'm thrilled to be apart of Stephanie's blog today and really enjoy her writing style! What a fun way to start off my morning and what a way to make a gal feel special! Please go by Furniture Flippin's website and let them know you saw it here! Happy to say the Ornate Country White Dining Room set, is now a STAR! 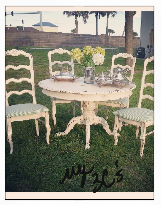 ***SOLD***Distressed and Antiqued Country White Round Table with Four Chairs. Blue and green striped cushions. Ornate detail throughout! Here is the link to my featured piece of furniture. Have a great Friday everyone! All the best!